Meet the baddest little 4-year-old in the land. 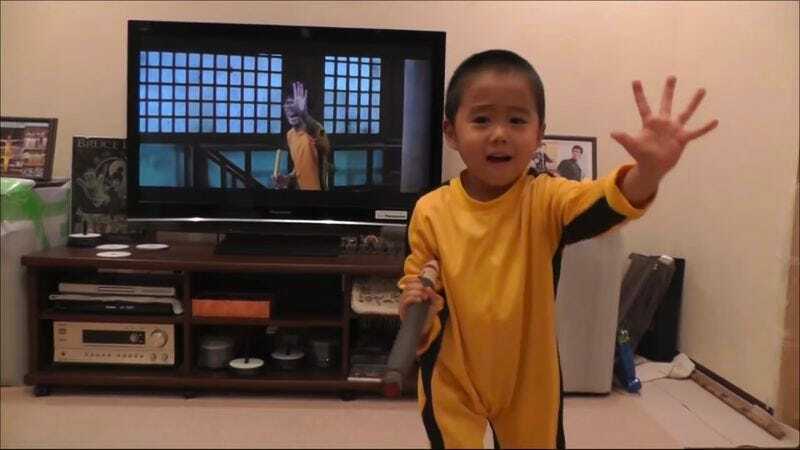 Not much is known about this mysterious child, except that he can perfectly replicate the nunchuk (nunchaku? whatever Michelangelo used in Teenage Mutant Ninja Turtles) moves of Bruce Lee. Cribbing Lee’s technique from such films as Game Of Death, Return Of The Dragon, Chinese Connection, and Enter The Dragon, this child is incredibly proficient at whipping around those sticks in a way that will make any kindergarten teacher shudder with fear. Expect the martial arts prodigy to land a multi-picture deal shortly. Or at least an ABC Family show called Nun & Chuck in which he travels around solving mysteries with the aid of his nunchuks and his guardian, a nun played by…let’s say, Judy Greer. This thing writes itself!